, a very eminent mathematician and philosopher, was born Jan. 22, N. S. 1592, at a village called Chantersier, about three miles from Digne in Provence, in France. His father, Antony Gassendi, a Roman catholic, educated him with great piety, and the first words he learned to pronounce were those of his prayers. This practice made such an impression upon his infant mind, that at four years of age he demonstrated the good effects of it in reproving or exhorting his playfellows, as occasion prompted. In these first years of his youth he likewise took particular delight in gazing at the moon and stars, in clear uncloudy weather, and was so intent on these observations in solitary places, that his parents had him often to seek, not without many anxious fears. 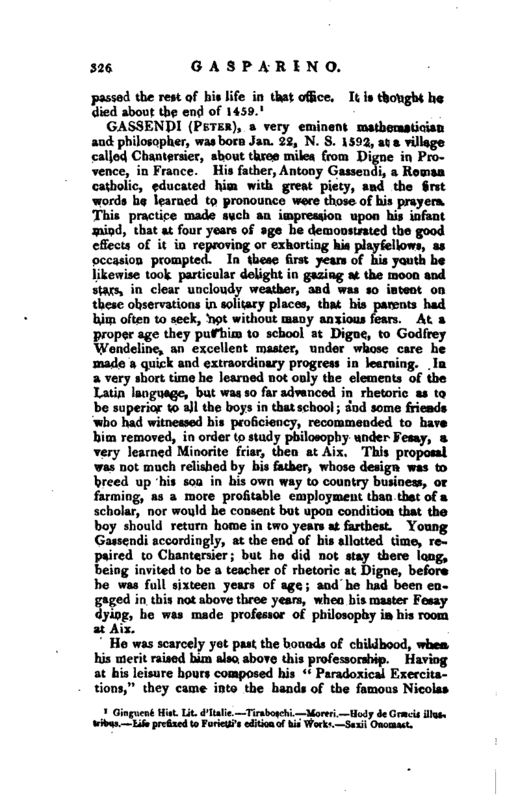 At a proper age they put him to school at Digne, to Godfrey Wendeline, an excellent master, under whose care he made a quick and extraordinary progress in learning. In a very short time he learned not only the elements of the Latin language, but was so far advanced in rhetoric as to be superior to all the boys in that school; and some friends who had witnessed his proficiency, recommended to have him removed, in order to study philosophy under Fesay, a very learned Minorite friar, then at Aix. This proposal was not much relished by his father, whose design was to breed up his son in his own way to country business, or farming, as a more profitable employment than that of a scholar, nor would he consent but upon condition that the boy should return home in two years at farthest. Young Gassendi accordingly, at the end of his allotted time, repaired to Chantersier; but he did not stay there long, being invited to be a teacher of rhetoric at Digne, before he was full sixteen years of age; and he had been engaged in this not above three years, when his master Fesay dying, he was made professor of philosophy in his room at Aix. He was scarcely yet past the bounds of childhood, when his merit raised him also above this professorship. Having at his leisure hours composed his “Paradoxical Exercitations,” they came into the hands of the famous Nicolas | Peirese, who joined with Joseph Walter, prior of Valette, in a resolution to take him out of the way of losing his time in empty scholastic squabbles, and procure him a place in the church, which would afford him such leisure and quiet as was necessary for cultivating more useful researches. Being now of years sufficient to receive the priesthood, he entered into holy orders; and after being first made a canon of the church of Digne, and D. D. he obtained the wardenship or rectory of the same church, which was carried by the interest^>f his two friends, though not without some difficulty, against several competitors. He held this place for the space of twenty years; and during that time several of those pieces were written which make up th collection of his works. In 1628 he accompanied Francis Luillere, master of accounts at Paris, in his journey to the Netherlands; which was the only time he was ever out of France. In Holland he wrote his Exercitation against Fludd in defence of Mersennus, who, upon his setting out on this journey, had put Fludd’s book into his hands for that purpose. During his stay in this country, he also became acquainted, among others, with Des Cartes and John Gerard Vossius; against the former of whom he maintained a dispute upon the subject of metaphysics, and he convinced the latter of his great skill in mathematics. In 1640 he was nominated for proctor of his diocese in the general synod of the Gallican church, but the election was carried for another by the interest of cardinal Richelieu. Gassendi had from his infancy a turn to astronomy, which grew up with his years; and, in 1618, he had begun to make observations upon the stars, and to digest them into a method. His reputation daily increasing, he became so eminent in that science, that in 1645 he was appointed royal professor of mathematics at Paris, by the interest of Alphonse du Plessis, cardinal of Lyons, and brother to car/dinal Richelieu. 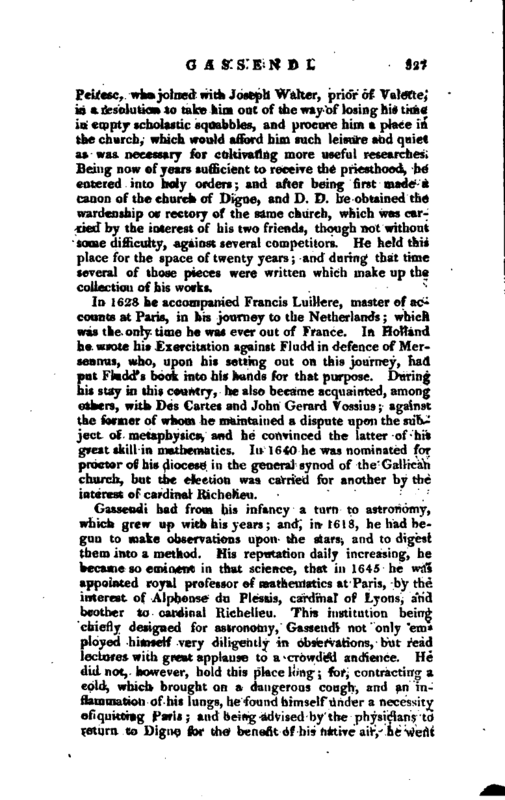 This institution being chiefly designed for astronomy, Gassendi not only employed himself very diligently in observations, but read lectures with great applause to a crowded audience. He did not, however, hold this place long; for, contracting a cold, which brought on a dangerous cough, and an inflammation of his lungs, he found himself under a necessity of quitting Paris; and being advised by the physicians to return to Digue for the benefit of his native air, he went | there in 1647. This advice had the desired success; which was also effected the sooner by the kindness of Louis Valois, earl of Alais, and viceroy of Provence, who, observing the philosopher’s circumstances, invited him to his house; where Gassendi’s conversation upon points of learning gave him so high an idea of his talents, that he frequently made use of him as a friend and counsellor in political affairs. After enjoying this honourable ease until this nobleman was called to court, Gassendi returned to Digne, where he began to write the Ij^e of his patron, the famous Nicolas Peiresc, a task which had been enjoined him by the earl of Alais. He resided at Digne till 1653; when, in company of Francis Bernier, physician, and Anthony Poller, his amanuensis, he returned to Paris. Here he lived in the house of M. Monmor, master of the court of requests, at whose request he had formerly engaged to write the life of Tycho Brahe, and then made several collections with that view; and this request being now renewed, he immediately set about the work, and published it at Paris, with the lives of Copernicus, Purbachius, and Regiomontanus, in 1654, 4to. But he neither suffered this nor any other business to prevent him from going on with his astronomical observations, and had no sooner finished the last-mentioned book than he proceeded to complete his system of the heavens. 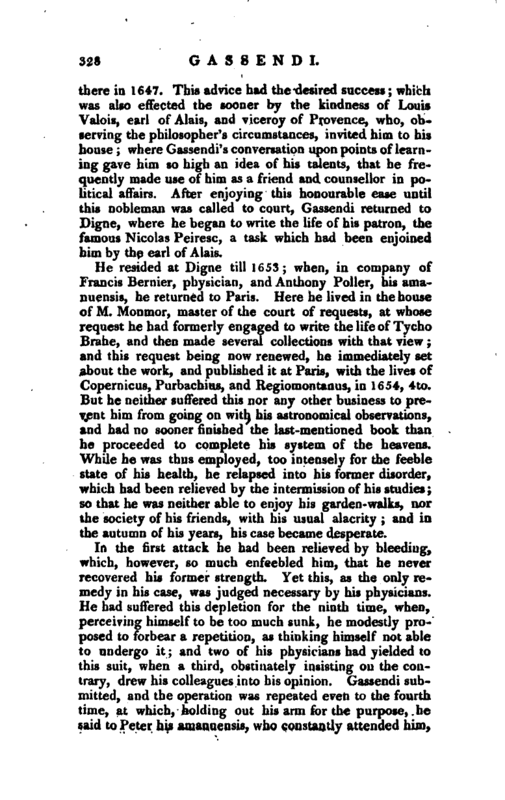 While he was thus employed, too intensely for the feeble state of his health, he relapsed into his former disorder, which had been relieved by the intermission of his studies; so that he was neither able to enjoy his garden-walks, nor the society of his friends, with his usual alacrity; and in the autumn of his years, his case became desperate. In the first attack he had been relieved by bleeding, which, however, so much enfeebled him, that he never recovered his former strength. Yet this, as the only remedy in his case, was judged necessary by his physicians. He had suffered this depletion for the ninth time, when, perceiving himself to be too much sunk, he modestly proposed to forbear a repetition, as thinking himself not able to undergo it; and two of his physicians had yielded to this suit, when a third, obstinately insisting on the contrary, drew his colleagues into his opinion. Gassendi submitted, and the operation was repeated even to the fourth time, at which, holding out his arm for the purpose, he said to Peter his amanuensis, who constantly attended him, | “It is more eligible by this deprivation of strength to sleep quietly in Christ, than to be taken off with more pain by suffocation.” Having undergone the operation, he presently felt himself approaching to his last hour, and sent for a priest to administer the viaticum; which being given, he expired about four in the afternoon, on Sunday, Oct. 22, 1655, in the sixty-third year of his age. At his death, his hand was found upon the region of his heart, which place he had frequently desired his amanuensis to touch, in order to mark its motion, which when this attendant observed to be very faint and fluttering, he said, “You see what is man’s life” which were the last words he spoke. He had made his will Oct. 15 preceding, by which he appointed M. de Monmor his executor, and left him all his Mss. with leave to publish such as he should think fit for the press; and that gentleman, with the assistance of another friend, having carefully collected and perused them, came to the opinion, that he had written nothing which was not worthy of him, and the whole was published by Monmor’s order at Leyden, 1658, in six volumes, folio. 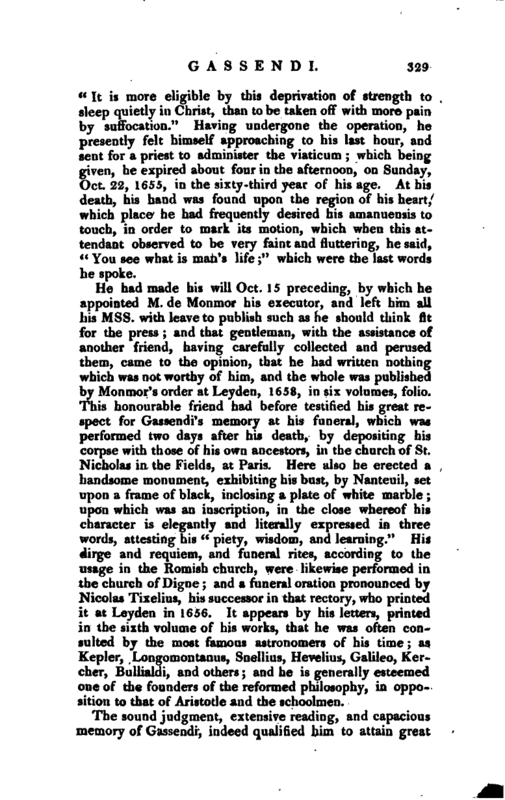 This honourable friend had before testified his great respect for Gassendi’s memory at his funeral, which was performed two days after his death, by depositing his corpse with those of his own ancestors, in the church of St. Nicholas in the Fields, at Paris. Here also he erected a handsome monument, exhibiting his bust, by Nanteuil, set upon a frame of black, inclosing a plate of white marble; upon which was an inscription, in the close whereof his character is elegantly and literally expressed in three words, attesting his “piety, wisdom, and learning.” His dirge and requiem, and funeral rites, according to the usage in the Romish church, were likewise performed in the church of Digne; and a funeral oration pronounced by Nicolas Tixelius, his successor in that rectory, who printed it at Leyden in 1656. 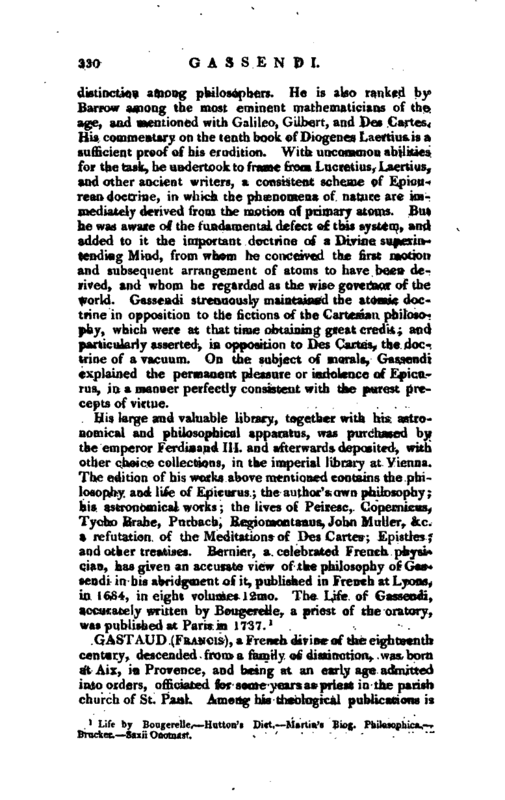 It appears by his letters, printed in the sixth volume of his works, that he was often consulted by the most famous astronomers of his time; as Kepler, Longomontanus, Snellius, Hevelius, Galileo, Kercher, Bullialdi, and others; and he is generally esteemed one of the founders of the reformed philosophy, in opposition to that of Aristotle and the schoolmen. The sound judgment, extensive reading, and capacious memory of Gassendi, indeed qualified him to attain great | distinction among philosophers. He is also ranked by Barrow among the most eminent mathematicians of the age, and mentioned with Galileo, Gilbert, and Des Cartes. His commentary on the tenth book of Diogenes Laertius is a sufficient proof of his erudition. With uncommon abilities for the task, he undertook to frame from Lucretius, Laertius, and other ancient writers, a consistent scheme of Epicurean doctrine, in which the phenomena of nature are immediately derived from the motion of primary atoms. But he was aware of the fundamental defect of this system, and added to it the important doctrine of a Divine superintending Mind, from whom he conceived the first motion and subsequent arrangement of atoms to have been derived, and whom he regarded as the wise governor of the world. Gassendi strenuously maintained the atomic doctrine in opposition to the fictions of the Cartesian philosophy, which were at that time obtaining great credit; and particularly asserted, in opposition to Des Cartes, the doctrine of a vacuum. On the subject of morals, Gassendi explained the permanent pleasure or indolence of Epicurus, in a manner perfectly consistent with the purest precepts of virtue. 1 Life by Bougerelle. —Hutton’s Dict. Martin’s Biog. Pbilosophica. Brucker. —Saxii Onomast.